Buddy, Can You Spare a Buck Fifty? You can always count on the SF Chronicle to miss the boat, even when it’s docked five feet away. 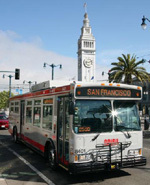 In a May Day column on MUNI’s continuing woes with “fare jumpers” who enter through the back doors of buses to avoid paying the price to ride, columnist CW Nevius pushed for the public transit system to get tough. It’s no laughing matter. According to a MUNI spokesperson, the agency estimates that it’s losing between $16 and $24 million to those who would rather sneak on the bus than fork up their buck-and-a-half. Even if the spokesperson is right, what Nevius never bothers to ask is the price tag for the salaries of the proof-of-payment officers and the development of the pilot prescreening program. Those things are not free. How much has MUNI spent thus far on those ideas? How much more will it spend? Since 2006, the number of proof-of-payment officers has increased from 21 to 54. Nineteen more are coming on board soon. All the time and effort that MUNI is spending trying to stop people from jumping the gate could be better spent on making our city’s public transit system free. As in you don’t have to pay a cent. It makes perfect sense. Other cities do it. Chapel Hill, North Carolina, for example, provides 142,000 hours of service each year, on a budget of $11 million and with a ridership of 5.7 million. In addition to the environmental impact of encouraging folks to leave the gas-guzzlers home, free public transit may even be cheaper in the long run, especially for a system such as MUNI that is going to spend more and more dough each year to enforce its fares. Don’t hold your breath waiting for The Chronicle to endorse the idea. To the City’s conservative daily, it makes more sense to keep upping the fares and cutting back service, then spending untold millions to punish folks who get on a bus without a transfer. I wonder if MUNI goes to Chapel Hill?